Digital art portfolio & learning resource. 3d Rock Studies: learning zbrush, 3ds max & displacement techniques. Here are a couple of images I’ve been working on that won’t make it into the portfolio but perhaps ought to be shared anyways…. So this is a 3ds-max-only scene. I wanted to get tight with up-close realism using procedural displacements so I could get less pixel issues. The ball is a vray material displace, rather than a vray modifier displace. It has a bunch of noise materials within noise materials. Bit of depth of field to add some photographic realism. I’m not keen on the ground as it just looks a bit too displaced, kinda like moulded metal rather than rock and stone. I also think the diffuse material on that is showing its pixels a bit (stretched a tiny bit due to the displacement which is always an issue to have to work around). 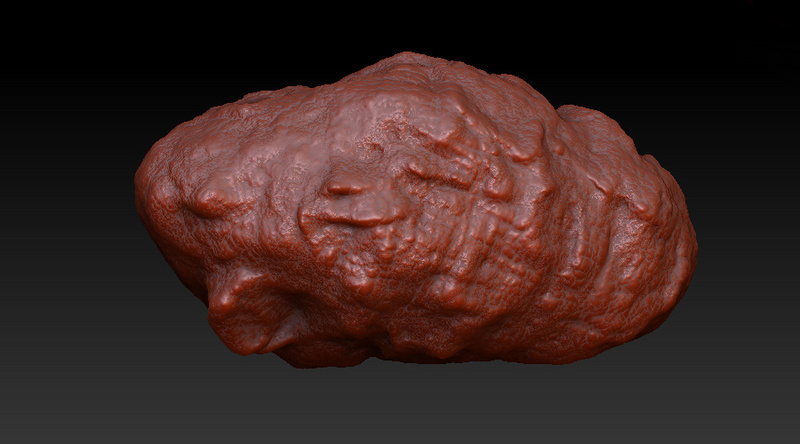 So these are my first zbrush rocks! (well, it’s just one, turned and replicated). Very exciting. I took a week off to study zbrush basics and it took every single MINUTE of that week to just about grasp the basics. 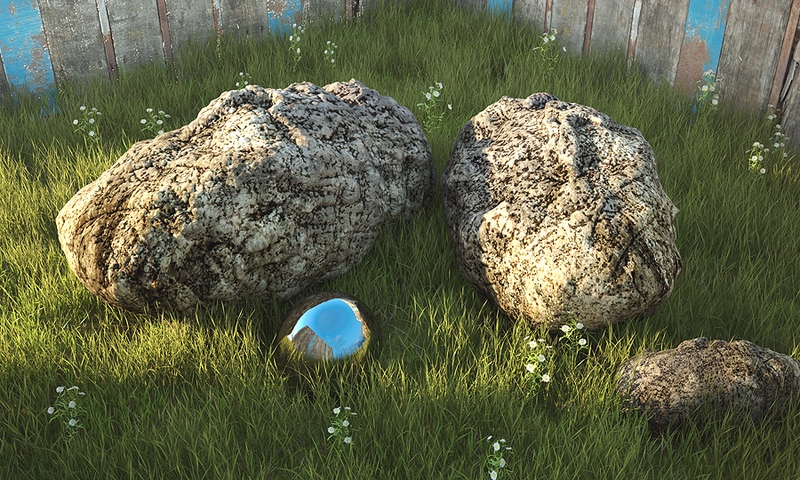 The above scene was just the rocks, modelled in zbrush, then brought into max manually (not used GoZ yet) and then some grass imported, lit and vray rendered. HDR was reflection only, the only light here is a vray sun. I still need to learn more about exporting between zbrush and 3dsmax and THEN replicating the awesome detail from zbrush into vray and the final rendered image. Two key issues: cavity maps from zbrush and vray dirt maps. Also worth noting that in this scene, the rock on the left is 300k polys and on the right is considerably less, about 50k. I put them side by side as a comparison. I can’t quite tell the difference which is good. But I think that’s due to all the messy grain on the rock texture acting as a disguise for the displacement/normal detail. So I will continue to study zbrush and making realistic rocks, and then my 3d environment stuff will…well, rock I guess. But man, the opportunities to create cool caves and rock faces. Very steep learning curve though, NOT for the feint hearted! Watch this space. Oh and if you have any questions, shoot me a comment and I’ll reply. 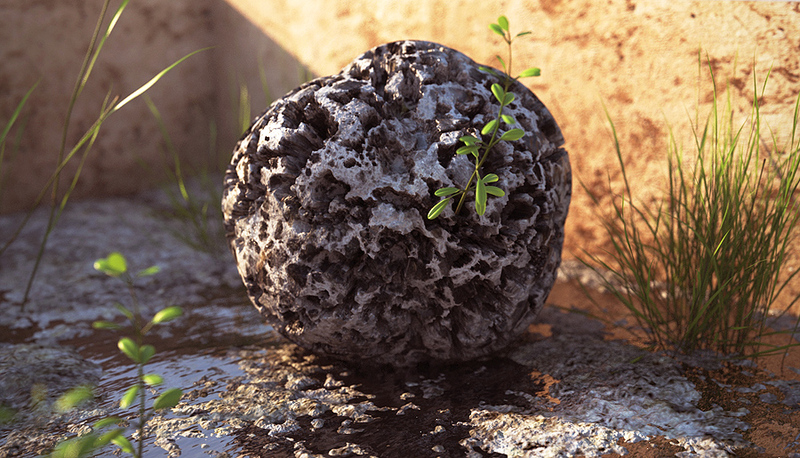 This entry was posted in My Artwork and tagged 3ds max, cavity maps, displace, export, rocks, stone, vray, zbrush. Bookmark the permalink. 4 Responses to 3d Rock Studies: learning zbrush, 3ds max & displacement techniques. Thanks for the post for posting “3d Rock Studies: learning zbrush, 3ds max & displacement techniques. alot more reading through and writing comments shortly. You’re welcome. Ask any questions you like! You mention that there are two key issues, those being cavity maps and vray dirt maps. I was wondering if you could expand on that and explain how to properly use them. I have experimented with vray dirt maps…sometimes to great effect but more often not. I have also generated cavity maps out of Z-Brush but with little idea on what to do with them. Any guidance is greatly appreciated and keep up the great work! Ah, I had almost forgot what cavity maps were (see, you learn something and then a few months later you forget it again!) but it’s come back to me now. A cavity map just gives you a black and white image whereby black is placed in the cracks and deep areas of the sculpt. You then export it along with you UVs and maybe texture map from Zbrush and then you overlay that cavity map in photoshop, probably on a multiply layer, and it’s just like dirty/shadow in the crevices of the object. Vray dirt I can’t quite remember if that works well on solid sculpts but is mainly used for some added ambient occlusion – gotta get the SCALE of the vray dirt correct though. If you want your dirt to seep out at about 6 inches, and it’s set to something stupid like 10 feet, you won’t even see the dirt!